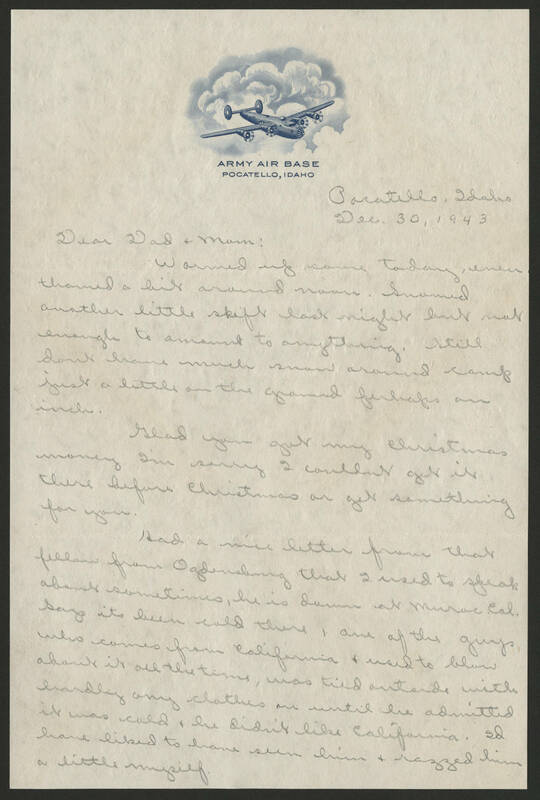 Pocatello, Idaho Dec. 30, 1943 Dear Dad & Mom: Warmed up some today, even thawed a bit around noon. Snowed another little skift last night but not enough to amount to anything. Still dont have much snow around camp just a little on the ground perhaps an inch. Glad you got my Christmas money I'm sorry I couldnt get it there before Christmas or get something for you. Had a nice letter from that fellow from Ogdensburg that I used to speak about sometimes, he is down at Muroc, Cal. Says its been cold there, one of the guys who comes from California & used to blow about it all the time, was tied outside with hardly any clothes on until he admitted it was cold & he didn't like California. Id have liked to have seen him & razzed him a little myself.